Lutron shades create perfect lighting for any space using the suns natural rays. Each style is designed to be energy efficient and to fit nearly any window space including skylights, angled windows, large office spaces and french patio doors. They come in a sheer (best for rooms that don’t need much privacy), translucent (ideal for areas that need a a bit of privacy), or blackout (better for areas that need total privacy). There are two types of styles with drapery systems; Traditional Drapery Track Systems and the Kirbe Vertical Drapery System. 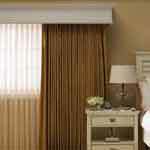 The Traditional Drapery Track System option comes in a pinch pleat, or ripplefold design. The pinch pleat look is created by the tight gathering of the fabric at the top which causes the fabric to look pinched. The ripplefold design has a consistent ripple at the top of the drapery as it hangs from the track. Additionally, they can be installed on a straight track (right draw, left draw and center draw), or curved track (standard arc curve or 90 degree bend). Unlike the Traditional Drapery option that move from side to side, the Kirbe Vertical Drapery System pulls the fabric up and out of the way. This particular style is best for narrow windows are areas that can not accommodate stack back (the bunch of fabric that gathers as drapes are opened.) Kirbe Vertical Drapes can be used for more than window coverings. They can be incorporated into a home theater as a way to reveal a home theater screen! Wood Blinds are a stylist way to brighten up a room and are available in two types of wood; Basswood and Eden Wood. The main difference is that Basswood is designed to fit smaller windows and Eden Wood accommodates wider windows. Each style is available in various natural and painted finishes. Furthermore, the Eden Wood is available in custom color matching finish. There are also three wood valance styles as well; Sutton, Royal and Harvard. There are a few different options for mounting Tensioned Shades which can be installed with surface, inside, or recessed mounts. 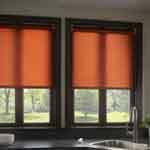 The motor is virtually silent and fabric collections include options for solar screens and total blackout. The delicate look of Horizontal Sheer Blinds are layered with fabric vanes to offer a perfect blend of natural sunlight. This layered combination still provided plenty of privacy, even when the blinds are open. 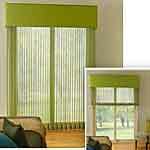 Horizontal Sheer Blinds have a light filtering and room darkening fabric option. Either selection includes various neutral colors which the fascia can also be fabric wrapped to match the color of the shades. 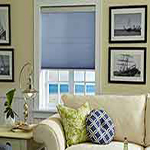 Roman Shades are the perfect solution to automate any window treatment with a homeowners own fabric selection. They are a bit different in that they come in the form of a fabrication kit. AIC will work closing with the homeowner and designer to ensure a pure, custom shading solution promised to last for years. The fabrication kit comes in three different options that specify the options in drive sizes. Honeycomb shades are a cellular design which add dimension and extra energy savings because the air pockets capture heat from entering through due to solar light. The cells are two inches and have a fabric option of sheer, translucent and room darkening. 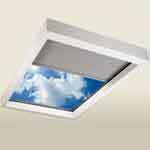 Additionally, the top headrail and bottom bar are available in matching or complementing colors. We take pride in designing and installing Shade Styles projects in homes and businesses throughout Hilton Head, Bluffton, Palmetto Bluff, Savannah, Beaufort, and surrounding areas. Call us today at (843) 836-5700 to discuss getting your project started!